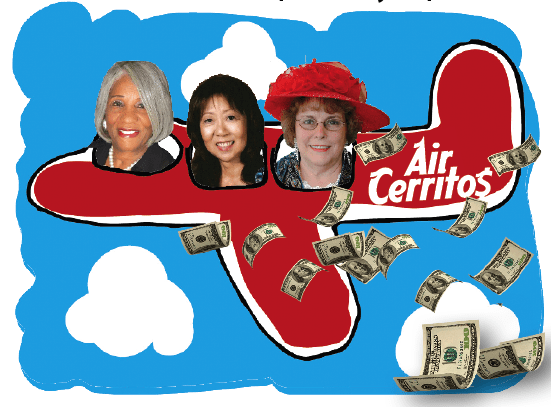 Cerritos Commissioners [l-r] Julietta Williams, Elaine Shiohama and Janet Beach attended the ‘Art Symposium’ in Miami, costing Cerritos taxpayers over $8,000. Doris Iglesias who also attended is not pictured. Graphic by HMG-CN. Hews Media Group-Community News has confirmed through a public records request that commissioners of the Cerritos Fine Arts and Historical Commission went on a lavish trip to Miami Florida, spending over $8,000 to attend the 2013 International Sculpture Symposium that took place between November 30 and December 4. The commissioners who attended were Janet Beach, Doris Iglesias, Elaine Shiohama, and Julietta Williams. One commissioner, Nora Benzon, who is an appointee of Mayor Mark Pulido, choose not to attend. The four stayed at first-class accommodations paying an average of nearly $200 a night, racking up $3,200 in total accommodation fees. A deeper review of the travel reports submitted by the four commissioners show that two of them paid a lower air fare cost of $382, while the other two commissioner’s air fares were dramatically higher at $651 and $743. Further examination showed that the spouses of Williams and Iglesias attended and participated in various activities but the spouses only had to pay back the City partial costs of the trip. Williams stayed five nights for a total of $900, but her spouse was only charged for one night at $180. Iglesias stayed for four nights for a total of $720, but her spouse was not charged. Beach, who represents City Councilman George Ray on the Commission, also had her $413 registration fee paid for as well as hotel room at $190.97 per night at the Hyatt Regency Miami. Beach also turned in receipts totaling $109.39 for meals. Shiohama, who represents Councilman Bruce Barrows on the Commission, also spent four nights at the Hyatt Regency Miami and had the same room rate as Beach, records show and also had taxi fares of $66 and meal expenses totaling $164.51. The commission has come under scrutiny by Hews Media Group-Community Newspaper in the past regarding travel practices. In August 2010, Councilmembers Carol Chen, Bruce Barrows, and former Councilman Jim Edwards took a trip with five Fine Arts and Historical Commissioners to visit the Loveland Sculpture Show in Colorado. Like this trip to Miami, travel and hotel fees totaled over $8,000 over just a three day period. During that trip to Loveland, the group dined at The Canyon Chophouse spending over $375, including $40 steaks, and $38 crab cakes. On another night they spent over $260 for dinner eating wild salmon and prime rib. Six other meals averaged $100 each. In May of 2010, Chen, Barrows, and Edwards traveled to Las Vegas staying at the Aria. Receipts show a $348 dinner on May 23 and a $379 dinner on May 24. Meals included a $50 steak, a $54 mixed grill plate, three $40 filets and $18 French fries. In 2011, when Carol Chen was Mayor, council-members took a total of ten trips. In March, they again flew back to Washington D.C. and later traveled to Sacramento. In May, Barrows went on four trips, one to Palm Springs and three to Las Vegas, with Chen attending two. In Palm Springs, staying at the Waldorf, they dined on Foie Gras, $40 crab legs, $26 Dover Sole, Ahi Tartar and $26 in desserts.